If you are a user of Windows laptops as well as PCs, you probably do not need any introduction to Notepad. It is the most basic and simplest text editor offered by Microsoft. We usually make use of Notepad when we want to create a quick note and all the files that are created using Notepad are saved with the extension .txt; which in turn is supported by all the text editors out there. This also makes this text editor compatible to edit, open as well as modify across all platforms. Contrary to its status of being the simplest text editor, cool Notepad tricks, amazing commands as well as lesser- known extension files which can be of great help to the users. These cool Notepad tricks and hacks surely work towards making the Notepad text editor more productive for the users. 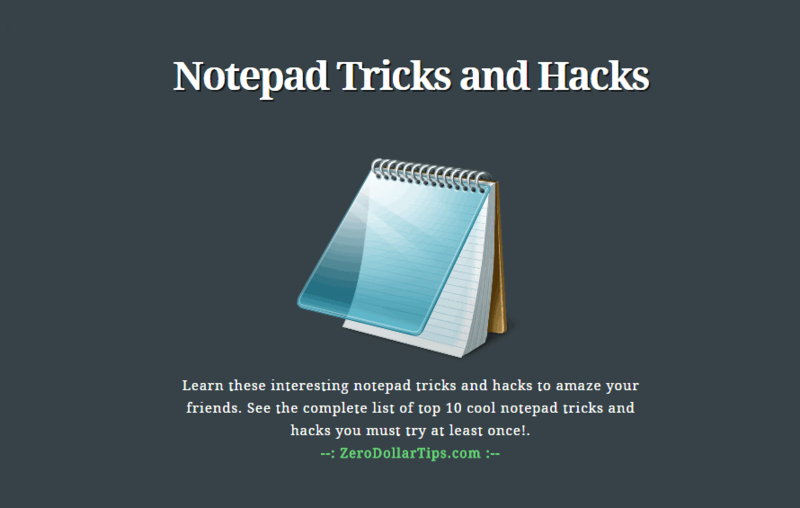 In today’s Notepad guide, we will familiarize you with some of the top 10 cool Notepad tricks and hacks that you can flaunt in front of your peers and also reap in great benefits at the same time! Generally, most of us say that notepad is the most simple and easy-to-use text editor. I completely agree with these statements but at the same time I also feel that notepad is also the most powerful and multifunctional text editor which has the ability to execute varieties of computer tasks and hacks. First of all, open Notepad. Try writing anything in this file and you will notice it being saved with the edited time as well as the date. Thus, you can easily create a diary file using notepad text editor. This notepad trick will help you a lot whenever you want to save something really important along with exact date and time. The next time you will click on this file, Windows will get shutdown automatically. Many Windows PC users who don’t want to waste three clicks (Start → Turn Off Computer → Turn Off) to shut down their PC they use this helpful notepad trick as quick shutdown Windows option. In place of Message Here, type your Error Message and in place of Title Here, type Error Window title. After clicking on this file, you will see custom- made Windows error message. I have tried it several times during my college days to fool my friends. Here, the default password “zerodollartips” is in red color. Change this with your own new password. When you will click on private.bat shortcut, it will create a private folder. You can move all your confidential files here. Now, no one can access this folder without knowing the password. If you know this useful Notepad trick then there is no need to download or install any folder locking software for Windows to protect your private files. On double- clicking this file, a prompt will open. Type the sentence that you want the computer to read. Click on “OK” and Notepad will read the sentence out loud for you. Click on Dance.vbs file and all the 3 LED lights will start dancing. To remove this effect, log off/ shutdown your PC. Now open this file and your CD Drive will start opening and closing continuously. In order to stop this, go to Task Manager (Press Alt+Ctrl+Del) and stop cdopen.vbs process. 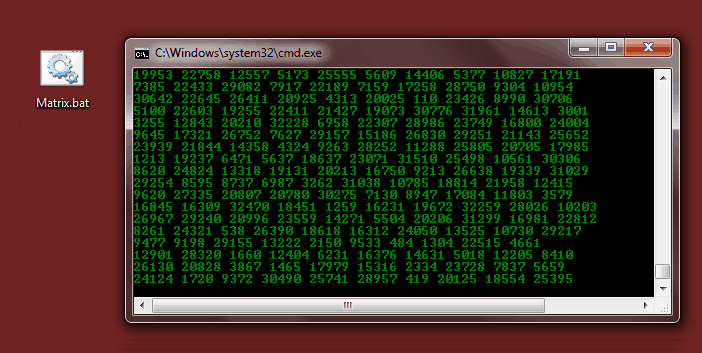 You must be familiar with the strings of green characters appearing on the screen randomly, known as Matrix. One of the cool Notepad tips and hacks, you can create the similar effect on your PC using the below two Notepad tricks. To see the Matrix show, click on this file. This file will be quarantine as a malware in case your antivirus real- time protection is working fine! Open this file to see the magic. These are some of the lesser- known Notepad tips and tricks. Try these cool notepad tricks and hacks yourself and see the magic unfold on your Windows PC. Let us know using the comments section below – Which notepad tricks generally you use on your PC? Which are your most favorite notepad tricks and hacks?